Lime, one of the most representative flavors in Indian and Mexican cuisine, provides much more than an intense sour taste. Learn more about lime's medicinal potential, its history, characteristics, and even unexpected uses. Geographic distributionTropical and temperate regions of the world. Hailing from Asia and the Middle East, the lime fruit is widely spread across the world and has become one of the most cultivated and traded citrus crops. Although limes have slightly less vitamin C than lemons, they are still regarded as a very healthy fruit, especially thanks to their low sugar content and their many health benefits. Preventing scurvy. Because of its high content of vitamin C (ascorbic acid), lime has been consumed for centuries to prevent the chronic deficiency of this essential nutrient. Treating viral infections. Due to its antimicrobial and antispasmodic properties, lime has been a proverbial remedy for alleviating the symptoms of cold and cough. Fighting anemia. 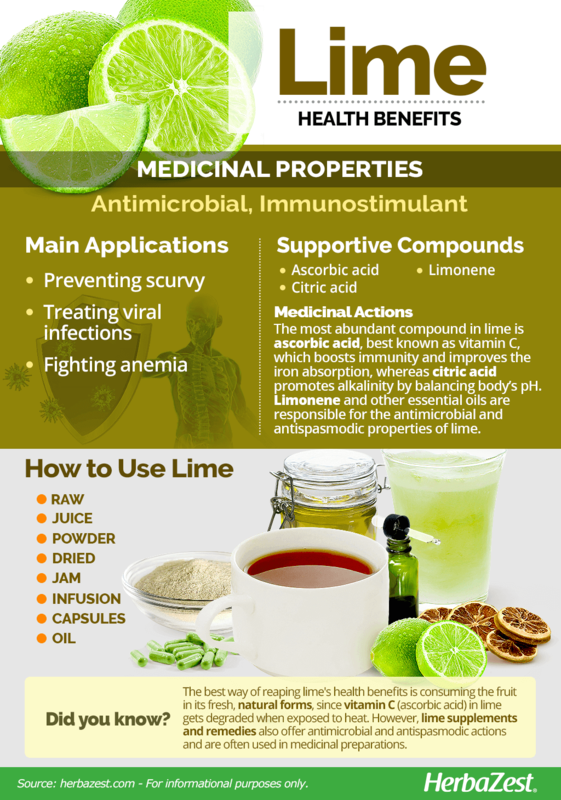 Because it plays a key role in the absorption of iron, a mineral crucial for the formation of blood cells, lime has always been useful for treating this common health condition. The most abundant compound in lime is ascorbic acid, popularly known as vitamin C, which is a water-soluble nutrient that plays an important role in immune function and improves the absorption of iron, which makes it particularly useful in treatment of anemia. On the other hand, the most important constituent in lime is limonene, followed by other essential oils, such as beta-pinene, gamma-terpinene, and citral. The combined action of these compounds is responsible for the intense citrus fragrance of lime, but also for its antimicrobial and antispasmodic properties. Due to their intense tart flavor, limes are often considered as acid-forming fruits; however, their citric acid content posses alkaline properties. Since the waste materials generated by the body are highly acidic, the pH balancing action of citric acid aids the natural self-cleansing activities of lymph nodes, liver, large intestines, kidneys, lungs, and skin, facilitating the removal of waste materials and enhancing cellular metabolism. Preliminary studies suggest that lime juice may also help prevent kidney stones by aiding the elimination of calcium oxalate. Other herbs with pH balancing effects are beets, camu camu, and lemon, whereas apple, onion, and thyme have antimicrobial properties. On the other hand, immunostimulant benefits can be obtained from bell pepper, echinacea, and goji berry. People with citrus allergies may experience different kinds of reactions from eating lime, including skin rashes. 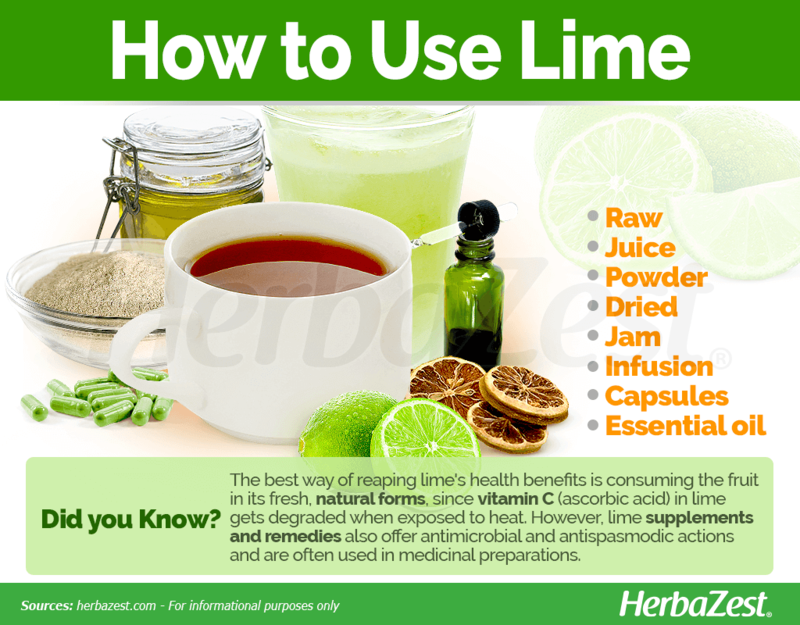 Topical use of lime juice can also cause irritation. However, oral consumption is generally regarded as very safe for the majority of the population. In vivo studies suggest that lime fruit juice can cause a reduction in the anticoagulant activity of the drug warfarin. People with citrus allergies must be aware that the consumption of limes may trigger anaphylactic shock. The nutritional value of lime lies in their generous amounts vitamin C (ascorbic acid), a water soluble nutrient that plays a major role in stimulating the immune system, thus helping prevent scurvy, colds, cough, and recurrent viral infections, as well as enhancing intestinal calcium and iron absorption, which contributes to treat and prevent osteoporosis and anemia. 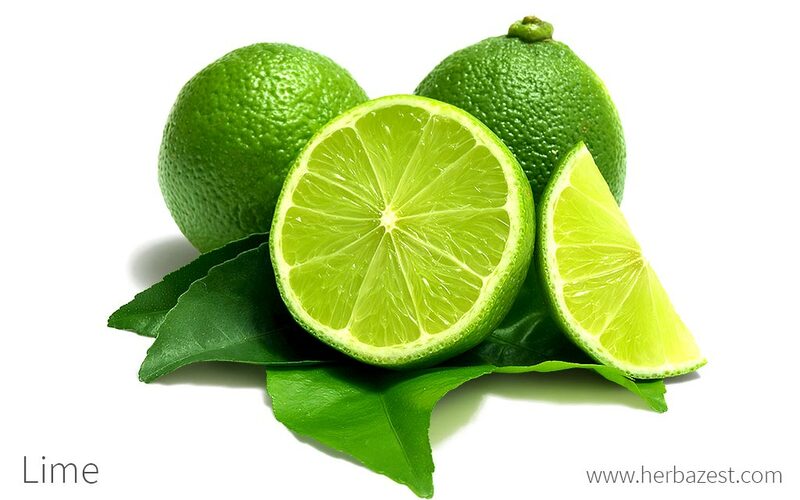 Additionally, limes provide good levels of dietary fiber, which aids blood sugar control and improves digestion, as well as adequate amounts of copper, an essential mineral that is key for the production and transport of red blood cells, also supporting the health of blood vessels, nerves, immune system, and bones. 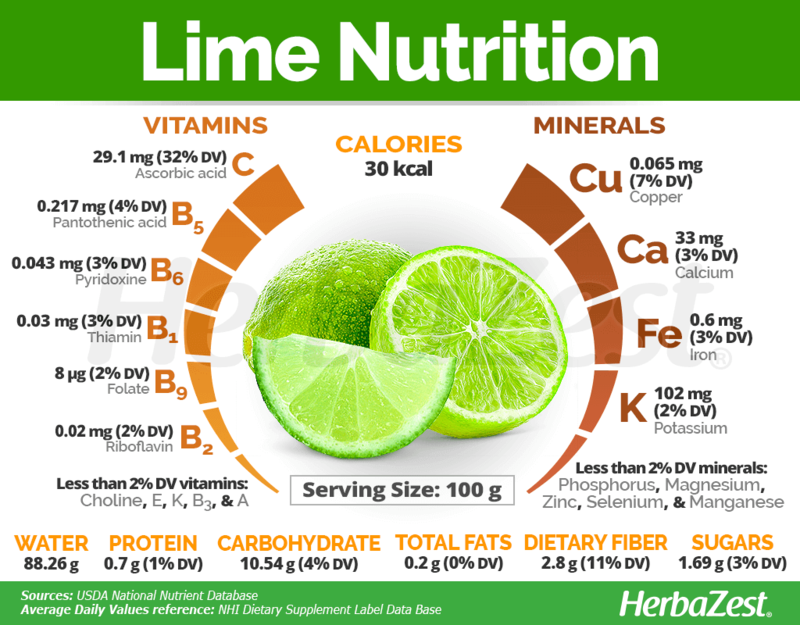 Small amounts of other nutrients, such as calcium, iron, and potassium, along with B group vitamins, also contribute to the overall health benefits of lime. 100 grams of raw lime fruits provide 30 calories, as well as 11% of the recommended daily value for dietary fiber. The best way of reaping lime's health benefits is consuming the fruit in its raw, natural form, since the vitamin C (ascorbic acid) in lime gets degraded when exposed to heat. However, lime supplements and remedies also offer antimicrobial and antispasmodic actions and are often used in medicinal preparations. Raw. The properties of lime are better absorbed by the body from the raw, fresh fruit. Fresh limes can be added to a variety of culinary recipes, from drinks to salads and seafood dishes. Juice. Lime can be added to both food and drinks. In Florida and Latin America, it is often served with avocado or used to dress salads, which is a great way of taking advantage of its antioxidant, immune boosting power. Powder. Although this is not the most popular form of limes, the dehydrated and finely powdered pulp of these acid fruits provides all the benefits of the fresh forms and also has a longer shelf life. Lime powder can be added to juices, shakes, and desserts. Dried. When limes are naturally dried, they can be candied or consumed as a snack, like other desiccated fruits. However, this form has a lower vitamin C content. Jam. Limes can be made into marmalade, which usually includes the pulp and the peel of the fruits. This form may not have a high content of ascorbic acid, but it offers beneficial essential oils, which possess antimicrobial and antispasmodic properties. Infusion. When lime is consumed in herbal infusions, it loses part of its vitamin C content; however, its antimicrobial and antispasmodic actions are useful for treating throat infections, colds and cough. Lime plays a central role in a lot of Mexican recipes, as well as in many Asian dishes. Essential oil. 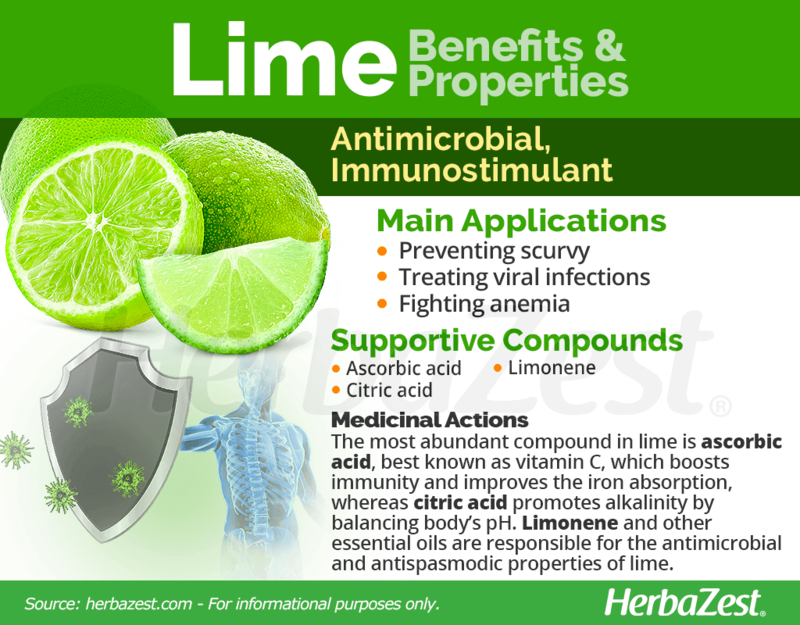 In this concentrated form, the phytocompounds contained in lime -mainly limonene- contribute to treat and prevent viral infections, as well as helping reduce muscle and joint pain. In aromatherapy, lime essential oil is thought to have an invigorating effect, restoring energy and appetite. Capsules. In this supplemental form, lime can be taken every day, in medicinal doses, and without tasting the natural acidity of the fruit. The antioxidant properties of lime are often used to boost immunity, aid iron absorption, and strength bones. The most popular varieties of limes (Key lime and Persian lime), as well as their many cultivars, are readily available all over the world. Raw limes are easy to find year-round in most grocery stores and supermarkets. In addition to the whole, raw fruit, lime juice is often sold as well. Lime remedies and supplements can also be found online in the form of essential oil and capsules. The lime tree is sensitive to the cold and does better in warm, temperate, or tropical climates. The lime shrub or tree grows best with full sun exposure and in freely-draining sandy loam with a neutral or slightly acidic pH. Lime seeds are usually sown in a nursery and later transplanted to the final plot, though grafts are also used to propagate the plant. It is best to plant lime separately from other trees and plants, as it does not like to compete for ground space. The lime tree needs to be fertilized every couple of months when first planted, and then more so in March and early April. Lime fruits will normally be harvested between October and March. Pests that may treat a lime tree include moths, aphids, and Phytophthora spp. Depending on the variety, a lime tree can grow up to 8 - 10 feet (2 - 3 m). The fruit may have seeds or not, but it is very juicy and has an acid flavor. Limes tend to be round and measure around two inches (5 cm) across. The trademark shape of the lime fruit and the bright green color of the rind make it easily recognizable. All limes belong to the Citrus genus, which is part of the Rutaceae family, along with about 150 genera and over 900 species of mostly trees and shrubs, distributed across tropical and temperate regions of the world. Among the most economically important members of this family are orange (Citrus sinensis), lemon (Citrus limon), and grapefruit (Citrus x paradisi). There are three varieties of lime: the Persian lime, the Key lime, and the Makrut lime. Also known as Tahitian lime, it is the most widely cultivated lime, with Mexico being the largest producer. It is a hybrid of Citrus aurantifolia (Key lime) and Citrus limon (standard lemon), and it is slightly less sour than the Mexican lime. Persian lime has several cultivars, including 'Idemor', which bears a smaller fruit; USDA 'No. 1', which is a virus-free clone; and 'Bearss', which was historically produced but is no longer considered distinct enough to be its own cultivar. Also known as the West Indian lime or Mexican lime, it is produced heavily in India and parts of Mexico, where it is the preferred variety for domestic use. This type of lime has a very tart flavor. Some cultivars of key lime are 'Everglade,' pollinated by flowers of grapefruit but without the characteristics of this species; 'Kagzi,' most commonly cultivated throughout India; 'Palmetto,' pollinated by the 'Sicily' lemon; and 'Yung,' of unkown origin, which was introduced into California from Mexico around 1882. This is a lesser-produced but well-known lime variety, also called Kaffir lime, which is popular in Southeast Asian cuisine. The name "lemon" comes from the Persian word limu, which was later converted into leimun by the Arabs. The lime fruit was introduced from the Middle East to Europe by the Crusades. By the mid-13th century lime's cultivation spread to Italy and France. Later on, it was brought to the Caribbean islands and Mexico by the Spaniards, and by 1520 it was commonly grown in Haiti. Limes became a popular crop in Florida during the early 1900s, where the citrus fruit was given the name of "Key lime." On the other hand, the Persian lime, also known as Tahitian lime, appears to be a hybrid of lemons and Key lime, and it is thought to be originated in Malaysia, from where it was first brought by Portuguese traders to Brazil and Australia, being later introduced to California from Tahiti between 1850 and 1880. Lime is cultivated and sold throughout the world, but Mexico and Brazil are the world's largest producers. The world production of lime reached 17 million tons (15 million tonnes) in 2012. Lime production, similar to other citrus fruits, has always been climatically limited in the United States, with South Florida being the biggest producer of Persian limes. Perfumes and cosmetics. Lime's aromatic constituents and vitamins can be found in many cosmetic products, such as creams, soaps, and perfumes. Aromatherapy. Lime essential oil is also used for aromatherapy, air fresheners, or candles. Industrial uses. The sour and alkaline properties of citric acid are used to flavoring and preserve food products, such as jam, candies, beverages, and many others. Additionally, lime juice can be applied to the hair to bleach light streaks, and its also useful cleaning coffee and calcium deposits from pots and kettles.